Part 2: Eric Lichtblau on “The Nazis Next Door: How America Became a Safe Haven for Hitler’s Men” | Democracy Now! We continue our conversation with Pulitzer Prize-winning journalist Eric Lichtblau about his new book detailing how America became a safe haven for thousands of Nazi war criminals. Many of them were brought here after World War II by the CIA, and got support from then FBI Director J. Edgar Hoover. Click here to watch part 1 of this interview. Read the prologue to The Nazis Next Door: How America Became a Safe Haven for Hitler’s Men. 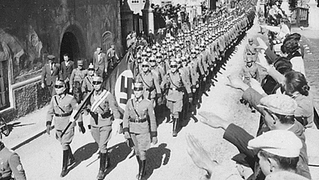 JUAN GONZÁLEZ: We continue our conversation with investigative reporter Eric Lichtblau, author of a new book that unveils the secret history of how America became a safe haven for thousands of Nazi war criminals. Many of them were brought here after World War II by the CIA and got support from the FBI’s director, J. Edgar Hoover. AMY GOODMAN: Eric Lichtblau’s book is called The Nazis Next Door: How America Became a Safe Haven for Hitler’s Men. You can read the prologue on our website at democracynow.org. Eric, we left the first part of the interview by you talking about those held in the concentration camps under the Nazis. Once the Allies won, the U.S. and Allies took over these camps. AMY GOODMAN: And the Jews and others were kept there, often under the supervision—if you could call it that—of the Nazi POWs who were put in these camps, as well. AMY GOODMAN: The people who had killed and murdered and maimed them. AMY GOODMAN: Can you take it from there and talk about General Patton and, ultimately, President Truman, as well? ERIC LICHTBLAU: Sure, yeah, yeah. It’s a remarkable saga and a fairly shameful period in postwar history. We sort of think of the concentration camps, you know, being liberated at Dachau, at Bergen-Belsen, at Auschwitz, by the U.S. and Britain and Russia. But liberation for the survivors who were left in the camps meant staying in those same camps, behind barb wire, under armed guard. And remarkably, sometimes they were supervised by the same Nazis who had lorded over them when the Germans were still in charge. And there was a report to Truman from the dean of the University of Pennsylvania Law School, a guy named Earl Harrison, that compared the camps to the Nazi concentration camps, except that, Harrison wrote, the only difference is we’re not exterminating the Jews. And General Patton, who ran the camps as the supreme Allied commander for the United States after the war, was furious when he read Harrison’s findings to Truman. And he wrote in his own journal—and I looked at these. I found the remarks so troubling and so jarring, I thought maybe at first they were a forgery, but it turned out to be true. He wrote in his own journal that what Harrison doesn’t understand, he thinks that the displaced persons in the camps are human, and they’re not. The Jews, he wrote—this is General Patton speaking—are worse than human, they’re locusts, and they have no respect for human dignity. And he recounted taking General Eisenhower, soon to be President Eisenhower, on a tour of the displaced person camps, and he said that Eisenhower didn’t really understand how loathsome the displaced persons were, and he thinks that they have some human dignity, when really they don’t. Patton, it turns out, was not only a virulent anti-Semite, but also held the Germans in a weird sort of place of respect. I also tell the story in the book about, in those displaced person camps, Patton went to the holding cells for the German POWs, the German scientists, and he sought out one in particular, General Walter Dornberger, who oversaw the production of Hitler’s V-2 rockets, which had been phenomenally successful and destructive in bombing London and Antwerp. And Patton brings him out of the cell and says, “Are you Dornberger? Are you the guy who ran the V-2 program?” And Dornberger said to him, “Jawohl, Herr General.” And Patton pulled out three cigars from his pocket and handed them to the Nazi general and said, “Well, congratulations. We couldn’t have done it.” And it sort of epitomized this attitude that he had towards the Nazis. He even defied an order from Eisenhower at one point, General Eisenhower, and maintained the Nazis as supervisors in the DP camps, because he saw them as the most competent group that the Allieds had. So, I think you need to understand how horrific the conditions were for the survivors to understand how it was that so many Nazis made it into the United States. ERIC LICHTBLAU: I think there was—yes. AMY GOODMAN: —in these rocket factories. ERIC LICHTBLAU: Sure. These rocket factories were basically torture chambers. These were places where 10,000 prisoners—not most of them Jews, but most of them POWs from France, Poland, Russia and elsewhere—were building on an assembly line—an assembly line of death, basically—hundreds of rockets each month for Hitler. And if they did not meet their quotas, if they did not work up to standards, if they were suspected of sabotaging the rockets, as some tried to do, they were hanged from a giant crane, and all the other prisoners would be gathered around to watch them. And those who weren’t intentionally killed, thousands of them died just from disease and malnutrition and exhaustion, kept in these horrible, horrible conditions literally inside a mountain in Nordhausen, where the factory was held. So, this was the production facility that Dornberger and Wernher von Braun, who went on to become even more famous, ran. And there was a guy who—physically at the mountain factory, named Arthur Rudolph, who was the production head at the Mittelwerk Nordhausen plant, he came to the United States, along with Wernher von Braun and Dornberger and the others, and Rudolph became almost as famous, as one of the geniuses behind the Saturn space program. And their Nazi legacies were basically erased. JUAN GONZÁLEZ: And, Eric, the government files and records that tell this story were kept, obviously, from the public for decades. Could you talk about the importance of those files finally being released to be able to put together this story? ERIC LICHTBLAU: Sure, sure. Well, the CIA, especially, and other intelligence agencies really went to enormous lengths to conceal their ties to the Nazis. They had had all these relationships, beginning immediately after the war through the ’50s, the ’60, in some cases even the ’70s, with Nazi spies and informants and scientists. And they went to great lengths to cleanse the records of a lot of the Nazis who came to the United States, removing material that showed their links to Nazi atrocities. Now, I found cases even in the 1990s, believe it or not, where you had the CIA actively intervening in investigations. By the 1980s and 1990s, the Justice Department was going after a number of these guys, was trying to deport them, for their involvement in war crimes, belatedly, I think. And the CIA—in the case of a Lithuanian security chief who was involved in the massacre of about 60,000 Jews, the CIA tried to kill that investigation in 1994 and '95. And they told Congress, yes, this guy was a CIA spy for us, this former Nazi collaborator, but we knew nothing of his wartime activities, is what they said. And, in fact, in their own files, in their own postwar files, it showed that they knew that this Lithuanian was under—quote, “under the control of the Gestapo and was probably involved in the murder of Jews in Vilnius.” So, this was—again, this is not the 1950s we're talking about; this is the 1990s, where people at the CIA were actively trying to conceal their ties. And some of these documents, as you suggested, only became available beginning in the 1990s, the late 1990s, when Congress ordered the declassification of war crime files. The CIA really resisted that at first. It took years for the historians to get at the war crime files. But beginning in around 2003, 2004, a lot of these files became declassified, and they really painted a pretty troubling picture. AMY GOODMAN: But even the piece that started you on this journey, Eric Lichtblau, in 2010 was about a report coming out that had been censored right until most recently. AMY GOODMAN: Explain why right through until these last few years the U.S. has refused to give this out? And the man who had campaigned to his death bed to have it released—it was a CIA report? ERIC LICHTBLAU: True. No, it was a Justice Department report. But as you say, it was kept under wraps for about five years. It was written in the mid-2000s. And I first got onto this, and really what started the book was that I got a tip that there was this exhaustive internal report at the Justice Department that looked at the efforts to go after the Nazis, and the Justice Department was sitting on the report. They had refused to release this publicly for very mysterious reasons. And I was able to get a hold of it and did a story on that. And I think even before I finished writing the story, I thought, you know, the material was so rich and so troubling that I wanted to try and do a book on it, because it really—it exposed both the successes of prosecutors in later years in going after these guys, but also really the just perverse relationships that the government had with a lot of these guys going back to the 1950s and 1960s. And that was something that the Justice Department did not want out there publicly. AMY GOODMAN: Can you talk about the anti-Semitism also of President Truman and then this issue of the scientists? What, 1,600 scientists were brought into the United States, many others, but at the same time, how many Jews were held in these camps, millions of them, not allowed to come into the United States? This is after the war. ERIC LICHTBLAU: Right, right. You know, I think the anti-Semitism really did play a part in the immigration policies after the war, which had the dual effect of both keeping out Jews—I mean, there were documents that I looked at from Senate immigration lawyers who actively said they didn’t—they thought Jews were lazy and not hard-working enough and didn’t belong in America. And so, it was very difficult. Only a few thousand Jews got into the United States in the immediate aftermath of the war. And you had something like 400,000 Eastern Europeans who, because of the, quote, “immigration quotas,” were allowed in in those years from places like Lithuania and Latvia and Estonia and Ukraine. And many of those, probably the vast majority of those 400,000, were in fact legitimate war refugees. These were people who were victims of Nazi occupation and were about to be taken over by the Soviet Union and were exiles. They really were. But among those 400,000 were many, many, probably several thousand or more, Nazi collaborators, and they came in with the group as—disguised basically as refugees and POWs. I mean, these were people who ran, for instance, a Nazi concentration camp in Estonia. There was—the head of that camp lived on Long Island for about 30 years. There were people who were prison camp guards. There were people who were the heads of Nazi security forces all throughout Nazi-occupied Eastern Europe. And it was very easy for them to basically fade into the larger group of war refugees and become Americans. ERIC LICHTBLAU: Thank you. Appreciate your interest. AMY GOODMAN: Pulitzer Prize-winning reporter for The New York Times. The new book, out this week, The Nazis Next Door: How America Became a Safe Haven for Hitler’s Men. You can read the prologue at democracynow.org. Thanks so much.